Hamtramck Academy tries 'Capturing Kids' Hearts' to boost performance and cut discipline issues. Read how Thomas Stone High School has 'flipped' over positive relationships. Breaking Free of the Behaviors That Hold You Back. 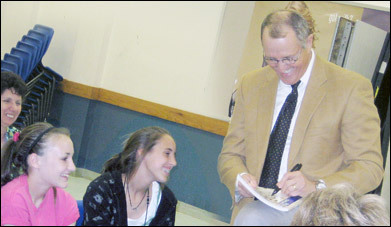 From left, GWJH students Tara Liska and Kelsi Bartlett look on as Flip Flippen autographs their book. The two attended Flippen’s presentation last Wednesday afternoon at George West High School. Just after the TAKS writing test was over at George West ISD, students were released early, while teachers and administrators stayed for a presentation from Flip Flippen, author of the New York Times best-seller, The Flip Side. The presentation was paid for in part by the George West Police Department, the Child Welfare Board, First National Bank, Choctaw Lease and the James Schroeder family. 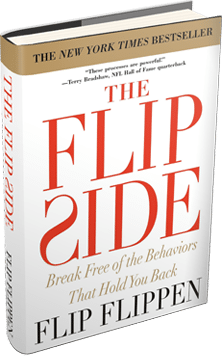 The object of Flippen’s book is to teach one how to break free of the behaviors that hold one back. “In his career Flippen has worked with gangs and ‘throw away’ kids; in fact, during that time he developed a 500-acre residential care and treatment facility for kids. During the rest of his career, he has worked with small rural schools like ours to Fortune 500 companies,” said Ty Sparks, GWISD superintendent. “Flippen has worked with corporate executives, educators, professionals, always staying focused on helping others do well. Flippen is a man with an uncompromising mission to develop relationships and processes that bring out the very best in people. I know you are going to enjoy his presentation; thank you for coming,” Sparks said before turning the floor over to Flippen. Flippen didn’t wait for answers; instead, he related a touching story on how he used the training to help 14 students receive scholarships. Within the first 10 minutes, Flippen had the teachers and administrators mesmerized with possibilities on how to bring out the best in students. In all, Flippen lists 10 “Killer Constraints” in his book, including being overly confident, having low self-esteem and procrastinating. The main thing you have to do is to identify which of these constraints is causing the biggest impact on your life and go after it.